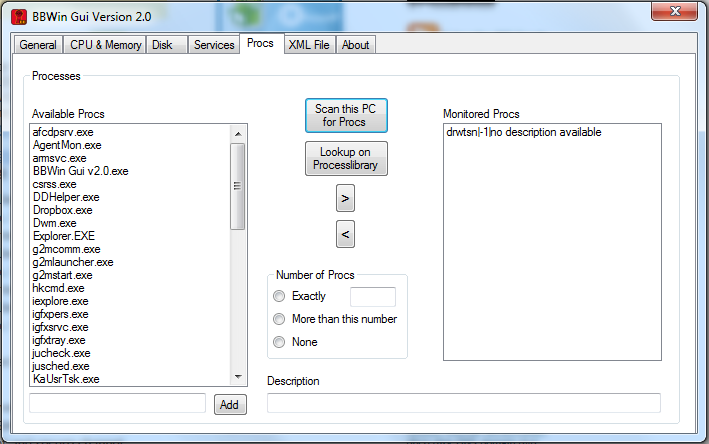 Today we are releasing a brand new fully redesigned BBWin GUI application that will allow the user to quickly and easily add or update the BBWin.cfg file. It is a small standalone application written in C# that provides for most of the configurations that you can find in the BBWin.cfg file. From managing your disks to selecting processes and services to monitor this tool does it all. When you first launch the GUI it will check to see if it sees the BBWin Service installed on your client and if not will allow you to download it directly from SourceForge. The next option will be to open an existing cfg file or download our default file. If you select open existing you will be presented with a Windows Explore window to navigate to the file you want to open. If you select to download the defaults it will pull a generic file from Squidworks.net and start you out with nothing configured. 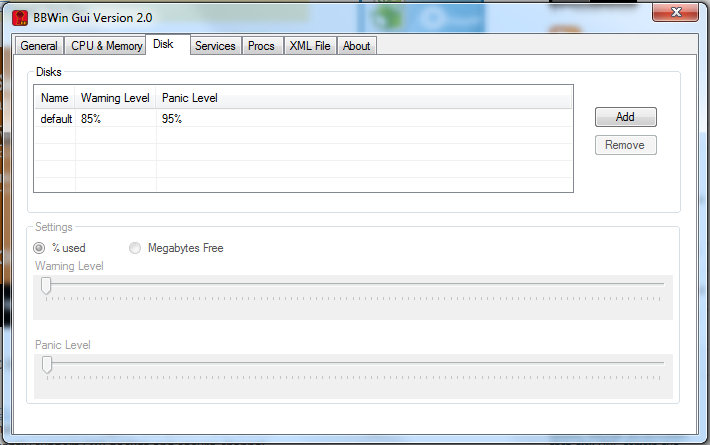 It will auto populate the system name and the default disks, CPU, Memory and Pagefile will be monitored. 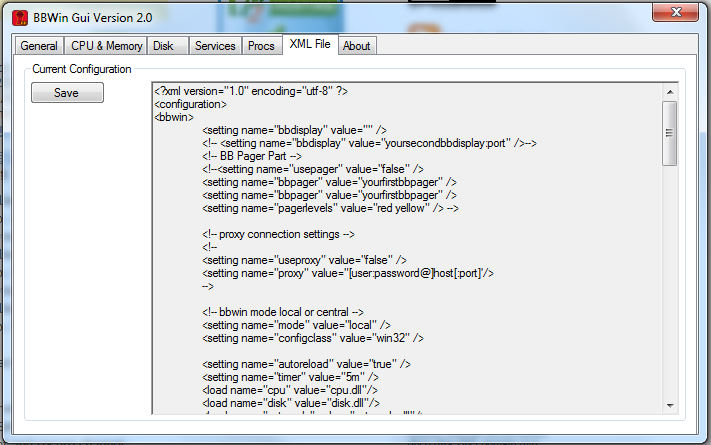 The BBWin GUI is uses a multi tab display to configure the different areas of the BBWin.cfg file. 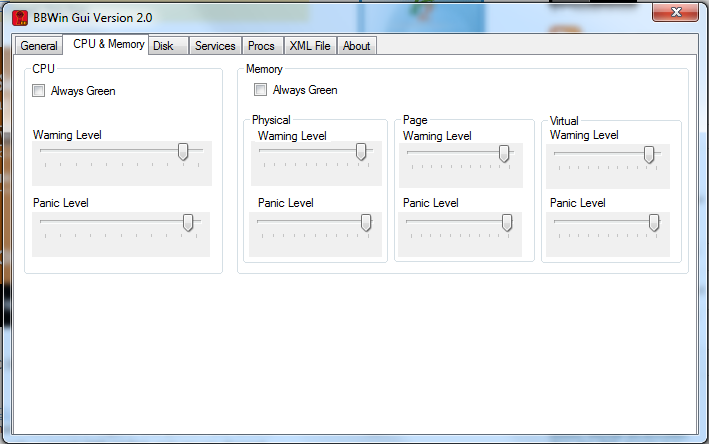 As you navigate across each TAB, different options will be displayed for you to modify as needed. We have incorporated sliders and simple presets areas to make it easier to adjust thresholds without making mistakes to format of the XML file. 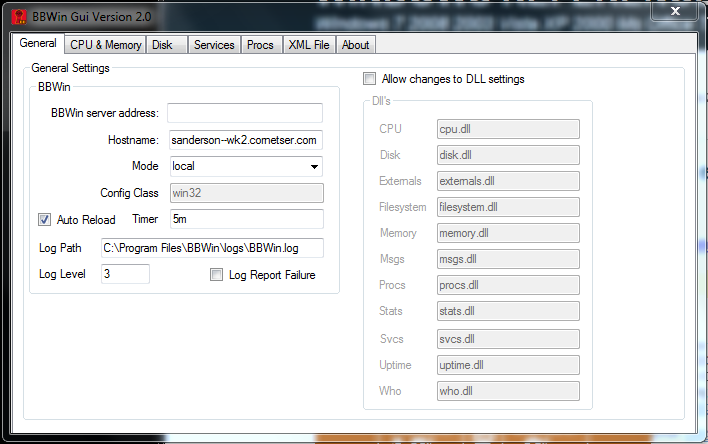 After making all your changes it is easy to save your file and watch BBWin reload automatically. Nope, this is the first I have heard of any failure to launch. Do you have admin priviledge? What platform are you running? We have tested on windows 2003 32 and 64bit Windows xp, Windows 7, Windows 2008 and R2. Worse case retry download, make sure you are at version 2.2 for GUI app and let us know how it goes. Nice work – very handy! – Allow the config file path to be specified as a command-line parameter. This would at least allow us to create a batch file to automatically load the local config file, effectively achieving the first suggestion. a sentence which is more lenient that than that of the repeat offender. You may be fined $1,000 or even more (again, penalties assessments may be taken), plus your driving license can be taken for as long as three years. do. Many drunk driving arrests occur at a sobriety checkpoint or in other non-accident state. I realize this subject had been idle for years but the tool still works great. If anyone is still maintaining and developing it then I would like to reiterate Michael’s suggestions above from Oct 2012. Some other suggestions would be to add the ability to control the Windows service (Start|Stop|Restart) from within the GUI.